Seriously, this is the best chicken salad I've ever eaten. Granted, I don't eat a lot of chicken salad, but I want to eat this one. I actually made it for my son's birthday party, and I was still thinking about it the next day. The first time I had this chicken salad, I was in college. A woman in the church (it sounds weird saying that because she's not all that older than me!) had me over for lunch and she served this on croissants. This was about 8-9 years ago, and I still remember loving this chicken salad. When I served this at the party, I served it on the small sandwich thin rounds. You know, the really thin bread that is shaped in a circle? it was perfect. OK, have I convinced you to try this yet? I think I'll make another batch this week. I'm craving it, like a crazy pregnant woman, which I am not. Go make this, you're tummy will thank you! First, boil and shred or cube the chicken. Next, sprinkle with salt and pepper to taste. Add celery and green onions to chicken and mix well. Squeeze half of lemon over the chicken mixture and mix again. Cover and let sit in refrigerator for at least an hour. I actually let mine sit over night and it tasted perfect. Before serving, add the mayo and grapes. Stir well and enjoy! Next time for your allocated amount of mayo try using a mix of 1/2 mayo & 1/2 rf sour cream. 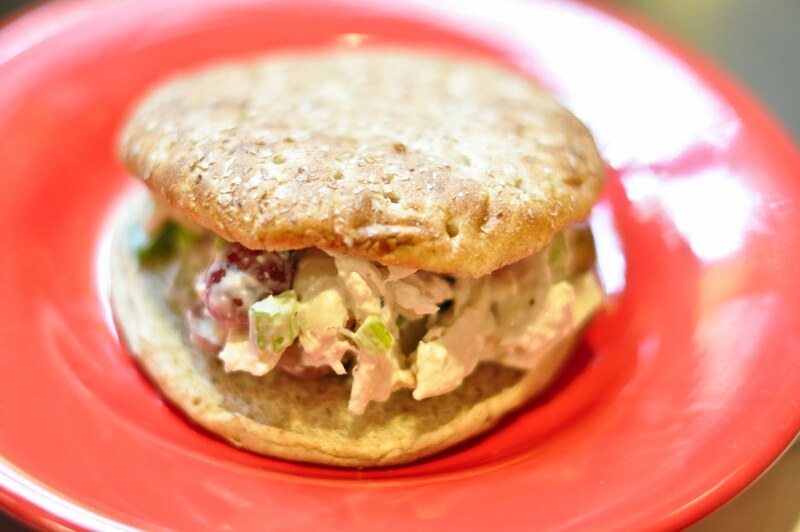 It makes the chicken salad so much lighter and actually more flavorful and reduces the fat and calories.